China’s foreign minister says a planned US missile defence system to protect South Korea from North Korea could threaten Chinese security. Wang Yi told Reuters news agency that the system went “far beyond the defence needs of the Korean peninsula”. The US and South Korea announced plans to deploy the system after the North fired a long-range rocket this month. China and Russia have previously said the system’s radar could penetrate deep into their countries. 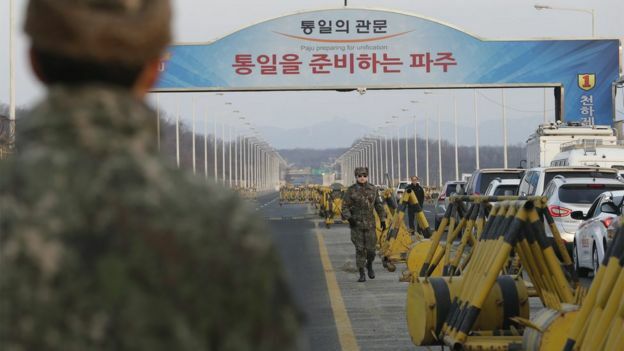 Talks over deploying the Terminal High Altitude Area Defence System (Thaad) come amid rising tension between the two Koreas over Pyongyang’s recent rocket and nuclear tests. On Thursday, North Korea vowed to cut two key communication hotlines after Seoul suspended its operations at the jointly-run Kaesong industrial complex in the North. The US and South Korea have said that Thaad is only designed to protect South Korea from a threat from the North and would not target China or anyone else. But Mr Wang urged the US to rethink its strategy. “The facts are clear. The deployment of the Thaad system by the United States… goes far beyond the defence need of the Korean peninsula and the coverage would mean it will reach deep into the Asian continent,” he said. Mr Wang also said China would back a UN Security Council resolution to make North Korea “pay the necessary price” for its recent rocket launch. Pyongyang insists its recent rocket launch was part of a peaceful space programme. But US officials say it was cover for the development of an intercontinental ballistic missile capable of striking the US mainland. The launch came weeks after Pyongyang conducted a fourth nuclear test. Both acts violate UN Security Council resolutions. Feb. 12, 2016 on BBC News. PreviousCan China Jump-Start Its Maritime Silk Road in 2016?